Give your appraisal reports a boost with location maps and flood maps powered by Google. 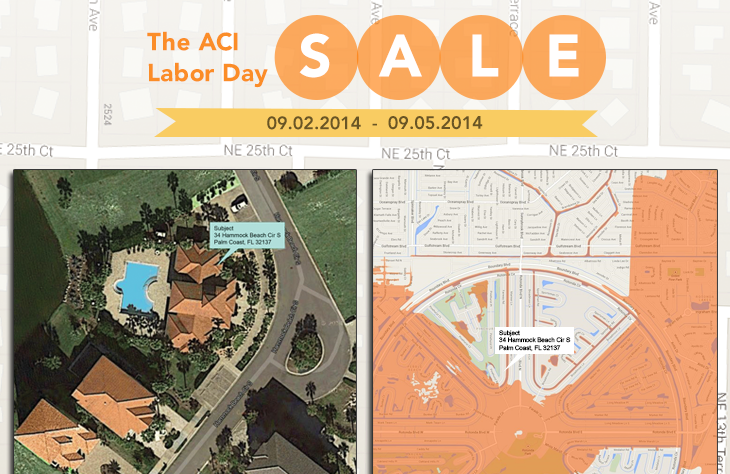 Call today and take advantage of our Labor Day Map Special which includes an entire year of ACI Sky™ Maps and Sky Flood™ Maps at the discounted rate of $175 per computer. The sale begins next Tuesday, September 2nd, and runs through Friday the 5th. To give Neighborhood Boundaries a try, select the Boundary tool and click points on the map to outline the area perimeter. If you’d like, you can add multiple boundaries and even save them in a library for future use. From rooftop to neighborhood create a map to your specifications with ease. In Aerial Map view, we place the Subject marker on a hybrid map at maximum zoom (use your mouse wheel to quickly adjust the zoom level). The property footprint is an outline of a structure on a street view map. Including: Census Tract, Special Flood Hazard Area, Flood Zone, Map #, Map Date, Community Name, and Community Number. A LOMA is an official letter of amendment to the National Flood Insurance Program (NFIP) map that establishes that a structures location is no longer designated as being in a Special Flood Hazard Area. With the handy Zoom option you can quickly drill down to get a closeup of the property, or zoom out to show more of the surrounding neighborhood. The closeup street view gives a helpful perspective of the lot outline along with placement of the structure. Just call 800.234.8727 and speak to an Account Executive for this exclusive offer.